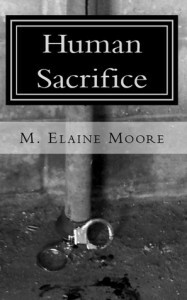 “Human Sacrifice” by M. Elaine Moore starts on a grim note when L.A.P.D. detective Aubri Payton’s work partner of several years dies in action. Worse, she can’t stand his replacement but is forced to work with him while dealing with her grief. The characters are set up instantly with viewpoints that allow the reader more insights. Their relationship develops gradually, providing much more depth than most cop dramas do. The chemistry between them develops on a believable pace and was one of the best parts of this book. They are well chosen protagonists. The plot takes the pair into danger and forces them to extreme action and choices. Great suspense and some explicit scene may make this unsuitable for the faint-hearted readers but a gripping read for the rest of us. Well done.